How do I change my password or the answer to my security question? You can log in to your Yandex.Disk from any device connected to the internet. To do this, type disk.yandex.com in the browser address bar, enter your Yandex username and password and click Enter. If you use two-factor authentication, you need a one-time password generated with the Yandex.Key app to log in. Yandex.Disk is available only for the users who have Yandex account. If you use a social network profile or phone number to log in to Yandex, change your account type to account on Yandex. To do this, on your Yandex.Passport profile page click the Create username link. Tip. For quick access to Yandex.Disk, bookmark the Yandex.Disk page or make it your browser's home page. Note. If you are connected to the internet from someone else's device and don't want the browser to save your username and password, turn on the Don't remember me option on the authorization page. Your session is then terminated when you close the browser or 2 hours after you finish working with Yandex.Disk. For more information, see the Log in to Yandex section. You can choose an account in Yandex.Disk, Yandex.Mail, Yandex.Passport and other Yandex services that support this feature. The chosen username is considered the main one: it is used to authorize you in services that don't support switching yet. You can add up to 15 usernames to the list. To remove a username from the list, switch to it and follow the Exit link. The current username disappears from the list and you automatically switch to the next one. 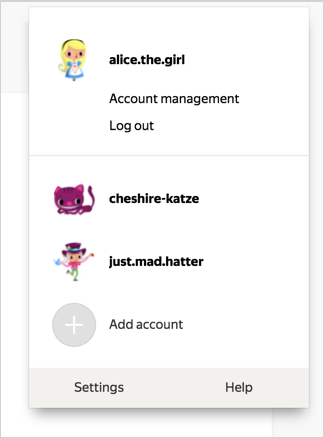 To remove several accounts from the list, follow the Add user, click the icon in the top left corner and click the icon to the right of the account you want to remove. Open the account menu in the top right corner of the screen and click the Log out button. If you forgot to log out from Yandex.Disk on someone else's device, open the Yandex.Passport page and click the Log out on all devices link in the Sign in and device history section. Attention. For further access to Yandex services, you will need to re-enter your username and password on each device. To change your Yandex password, open your account menu in the top right corner of the screen and click Account management. Then click the Change password link in the Passwords and authorization section. On the page that opens, enter your current password and enter your new password twice for confirmation. Enter characters from the picture and click Save. Attention. After your change your password, all sessions under your username on other computers are finished automatically. You can change your security question or answer on the Yandex.Passport page by clicking the security question link in the Passwords and authorization section. Install the desktop version of Yandex.Disk. Select all files and folders in the program window. Right click to open the context menu and select Create copy on computer. Your files will be downloaded to the “Downloads” system folder. The Download button will appear at the top of the screen. Click it. Files are downloaded in an archive format. You cannot download multiple folders. Folders can only be downloaded one at a time. However, you can move all your folders and files into one folder and download that single folder. You can restore your Yandex.Disk data after reinstalling Windows or changing your hard drive, if you remember the username and password for your Yandex.Disk account. After installation, enter the username and password from your Yandex account. If you forget the password, restore it following the instructions. Yandex.Disk is enabled by default for all Yandex users, you can't disable it. So it is impossible to delete the Yandex.Disk account. But you can remove all files on Disk and stop using it. In this case, you still can access other Yandex services (for example, Yandex.Mail). If you want to delete the whole Yandex account, read the article Deleting your account. In this case, all your data on all Yandex services is deleted and you lose access to these services.